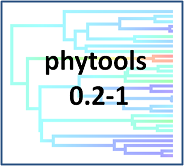 There is a new version of phytools on CRAN (phytools 0.2-1). This can be downloaded and installed from source from the CRAN or from the phytools webpage. It should also be available for installation using install.packages("phytools") some time in the next few days as the Mac OS and Windows binaries are built and phytools 0.2-1 percolates through the CRAN mirrors. 1. A new function (fastAnc) for fast ML ancestral state estimation (1, 2). 2. A new function (matchNodes) to match nodes between trees. 3. A new function (xkcdTree) to plot xkcd style phylogenetic trees (1, 2, 3, 4, 5, 6, 7). xkcdTree can also be called from within fancyTree. 4. A new Bayesian MCMC method (ancThresh) for ancestral character estimation under the treshold model (1, 2, 3, 4). 5. A new function (multi.mantel) for multiple matrix regression with Mantel test (i.e., "partial Mantel tests"). 6. A new method and function (densityMap) for visualizing the posterior density from stochastic mapping on the tree (1, 2). 7. Finally, a new function (contMap) for plotting the reconstructed values of a continuously valued trait on the tree (1, 2). The phytools R package now contains over 80 different function and an 87 page PDF manual. Yikes!